Cost: $50 per Scout. Snack will be provided. This Merit Badge Day will provide the opportunity for Scouts to work on completing swimming Merit Badge Requirements. Scouts should attend either the morning or the afternoon session on either Saturday or Sunday. Class limit of 20 Scouts per session. The front gate does not open until 8 am so please do not arrive early. Check-in is at 8:15 for Morning session. Scouts will be able to attempt each requirement (as time allows), but there is no guarantee they will pass each requirement. 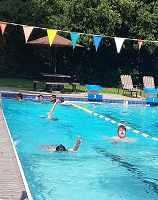 Also, if Scouts cannot pass requirement 2 (the swim test) they will not be allowed to participate in the rest of the session due to safety reasons. Scouts are strongly encouraged to practice each of these strokes prior to coming to the swimming merit badge day. Particularly focusing on sidestroke and breaststroke which are typically the most challenging strokes for Scouts. Please visit your local aquatic facility for formalized swim lessons to help develop these skills. Interested in SFBAC Aquatics? Volunteers are always needed and welcome for planning and implimenting all our aquatics activities. Volunteers interested in helping at any of the above events and/or becoming an Aquatics Committee member should contact Michelle Behrendt at michelle.behrendt@scouting.org to be added to the mailing list. When helping at Aquatics Activities, some positions require Aquatics Certifications, i.e. Lifeguard, Safe Swim Defense, etc. Support staff (kitchen, registration, etc.) do not require certifications.